There is an irony in moving to a really remote place for a quieter pace of life only to find you just have to do more travelling, which was what had happened by the time I started this project. I was exhausted by it. I also felt I had no real idea of whether this was the life I wanted because I was only actually here for half of the time. I needed to be in one place for a while. This project has allowed me to experience and enjoy the quieter life I originally came for. To put down some roots for a while. And it’s been lovely. I’ve been able to get into a routine. I’m doing lots of writing and work on new ideas and bigger projects. I have grown my own vegetables and am far more aware of the changing seasons. I have been doing lots of foraging and feel like a door mouse storing for the winter. I now have a mental map of the different mushroom patches in the woods. I sun dried my home grown tomatoes and have a big jar for later use. I pick blackberries for my breakfast and make my own bread. My friendships here have got deeper I get to watch my friends first baby, Oren, who was born last December grow and change. I am a part of his life and he part of mine in a way I couldn’t be otherwise. I run a film club in the village hall and have even begun writing poems again for the first time in many many years. Yesterday I climbed Meall Buidhe, my third munro, and remembered why one climbs big mountains. The view at the top was incredible, ethereal. I was above the clouds and each time they broke and I could see for miles across the mountains ranges. 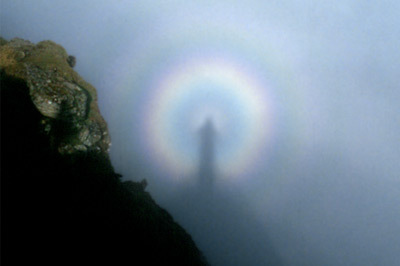 Then I saw the most vivid brocken spectre right appear between the two peaks. I understand why the Gods lived on mountains. I am not a spiritual person and yet that’s how I would describe being up there. There was even Golden Eagle which circled around me. It was ethereal and magical and it was an opportunity to gain a new perspective on things and remind myself why I live here. All of these things were very difficult to do when I was spending weeks away at a time. I lacked routine and solidity. It was difficult to build relationships. So despite the level of introspection this project involves, the occasional claustrophobic night sweats, and the small amount of money I am learning to survive on I am actually very grateful for this film.